Together, Veblen House and Cottage tell a story that extends from great wealth to hardscrabble farming. Though Oswald Veblen has been the central historic character, the house was built and first lived in by the Whiton-Stuarts, whose extraordinary wealth and history is becoming more apparent the deeper we dig. Veblen's grandfather was a pioneer farmer in Wisconsin and Minnesota. 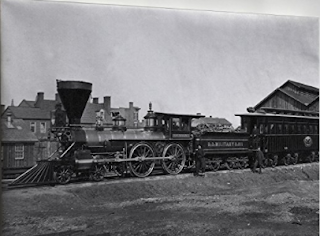 Whiton-Stuart's grandfather made a fortune playing a big role in the early growth of railroads in the mid-1800s. A granduncle worked for Lincoln supervising the military railroad during the Civil War. Internet research has been augmented by a few field trips. First, some friends, visiting Brooklin, Maine, tracked down the Veblens' summer cottage. More recently, we found the family burial grounds for the Whitons in Green-Wood Cemetery in Brooklyn, NY. Green-Wood Cemetery is no ordinary resting place. One of the first rural cemeteries in the U.S., it occupies some lovely high ground in Brooklyn, with vistas of the New York city skyline. Like Herrontown Woods, which was in part a reaction to the rapid displacement of rural landscape by post-WWII suburban growth in eastern Princeton, Green-Wood was a response to the rapid growth that was overcrowding NY's more traditional churchyard burial sites. Hard to say how the dead feel about Green-Wood, but it's a very pleasant place for the living to visit. The entryway makes a statement of general grandeur. Green parrots found the gateway sufficiently impressive that they have fashioned a communal apartment complex high up in the main tower. These are not the native Carolina parakeets, which were hunted to extinction around the same time as the mighty passenger pigeon, but escaped pet monk parrots originally imported from Argentina. Before Ohmsted designed Manhattan's Central Park and Brooklyn's Prospect Park, he may have taken inspiration from Green-Wood Cemetery, which in mid-19th century was "attracting 500,000 visitors a year, second only to Niagara Falls as the nation’s greatest tourist attraction." to people like Leonard Bernstein, who probably would have preferred to have been buried closer to the Steinway family several hillocks away. The grave markers proclaim their names loudly as you pass by, prompting leaps of the imagination. Is Henry A. Hudson related to the famous Henry Hudson? Is this the real McCoy? So much to research, so little time. Fortunately, this visit had a clear mission: find the Whiton family, without which there would have been no Jesse Paulmier Whiton-Stuart to bring the (Veblen) House to Princeton in the 1930s. The Whitons are gathered around a central obelisk with names carved on each of its four sides. Front and center is Augustus Sherrill Whiton, grandfather of Jesse. In 1838, as a newly trained civil engineer, he helped design the first branch of the Erie Railroad--the first railroad outlet to the west of New York--which would swing north up the Hudson, then west to Lake Erie. He later became superintendent of the Erie Railroad, and made a large fortune during over 40 years in the railroad business. In 1843 Augustus was married to Caroline, daughter of Thomas Ward, the Ramapo ironmaster and landed proprietor. Elizabeth Whiton, also on the obelisk, was their second child. "The pastor of one of the New York City churches has written us in a recent letter, "Many a time in recent years as I have reviewed my own life and recalled those whose character has inspired me, the picture of Mr. Whiton has been recalled to my mind. His balance of judgement was so true, his sympathy so constant, that as I think of him over a space of almost a score of years his likeness is very near the ideal of Christian manhood." 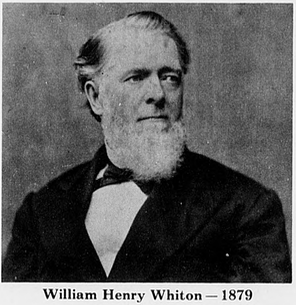 One of Augustus' brothers, William Henry Whiton, also spent his life in the railroad business. He became son-in-law to the president of the Erie Railroad, and during the Civil War found himself essentially running the wartime railroad for Abraham Lincoln. There was a steam engine named after WH Whiton that was photographed pulling a railroad car specially made for President Lincoln, and which would later carry Lincoln's casket on the long funeral procession back to Illinois. 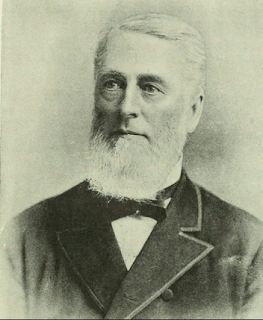 Jesse's father was Augustus Ward Whiton, the third child of Caroline Ward and Augustus Sherrill Whiton. Augustus Ward Whiton married Jennie Paulmier, then tragically died a year or two later "at Augusta, GA from an illness contracted on their wedding trip to Europe." Augustus W. had graduated from Columbia University, and was part of a railroad supply firm. Their only child was Jesse, born in Jersey City, which became terminus for the Erie Railroad in 1853. Jesse acquired his hyphenated last name, Whiton-Stuart, when his mother remarried. There are other surnames in this cluster of gravestones around the obelisk--Little, Faulkner, Pendleton, Bell, Bouche, and Quiggle--but those await further exploring. Jesse's mother Jennie is buried elsewhere in Green-Wood, next to the Stuart obelisk with her second husband, and Jesse strayed from his family at the end of his life, to be buried out in California. This post is prompted by a texted photo from a friend of mine, Carl Hildebrandt. It wasn't a casual selfie. He took it only after riding his bike all the way up a mountain outside Tucson, AZ to reach Kitt Peak Observatory, where there's a telescope named after my father. Carl, too, has math and science flowing through his veins. His grandfather Theophil Henry Hildebrandt's career as a mathematician paralleled Veblen's in many ways. 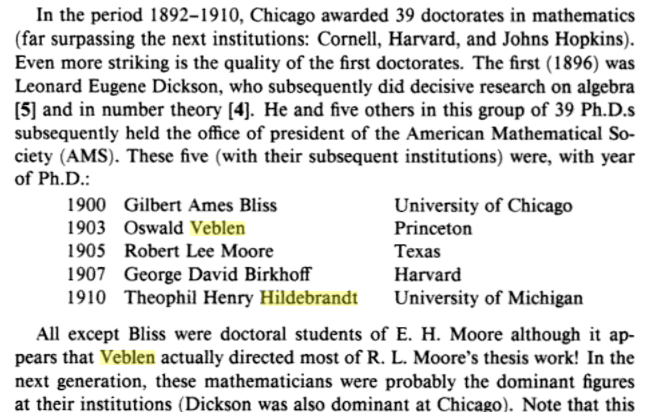 Hildebrandt arrived at University of Chicago for graduate work just as Veblen was leaving for Princeton, had the same advisor, E.H. Moore, then went on to chair the math department at University of Michigan from 1934-57, and serve as president of the American Mathematical Society from 1945-6. Carl's uncle Theodore spent 1947-8 working at Princeton with von Neumann, Goldstine, and Julian Bigelow on the IAS computer project. 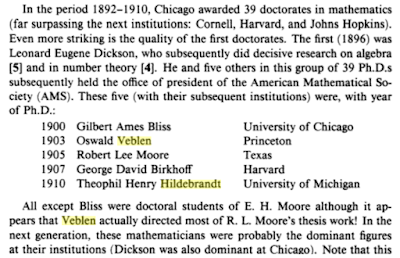 This snippet from Century of Mathematics in America portrays the University of Chicago as the academic center of gravity for American mathematics in 1900, spawning the PhD's who would then go forth to lead the growth of mathematics at Princeton, Harvard, Michigan and other institutions in the 20th century. Concurrent with this fertile production of many of mathematic's future leaders, Chicago also built Yerkes Observatory in Wisconsin, which in 1897 was far from city lights. Yerkes, where I lived while my father was an astronomer there, had many qualities similar to Princeton's Institute for Advanced Study--an academic enclave surrounded by fields and woods on the outskirts of a small town. The observatory remained a center of cutting edge research until the second half of the 20th century, when more advanced telescopes sprouted in drier climes, such as Kitt Peak, AZ. Tucson drew not only astronomers like my father, but also two of the Whiton-Stuarts--the family that built what would later be called Veblen House. They had already lived in Prescott, AZ, decades earlier, where Jesse spent his days on horseback herding cattle--a change of pace from running his high-end real estate firm in Manhattan. His wife, Mary (Marshall Ogden) Whiton-Stuart later moved back to Arizona to live in Tucson for the last 13 years of her life, as did her daughter, Silvia, for portions of that time. "To Speak At Dinner--Meet Dr. Gerard Kuiper, director of the Lunar and Planetary Laboratory at the University of Arizona, will speak Sunday at the annual Compact Day dinner meeting of the Society of Mayflower Descendants in the State of Arizona." Gerard Kuiper was a colleague of my father's at Yerkes, and Mary may well have been a member of the Society of Mayflower Descendants. They might have met had she lived a little longer. Thanks to Carl for prompting me to weave all these threads together.